The XE0092 is a complete telephone line interface or DAA (Data Access Arrangement) in a compact, surface-mount module. It offers an alternative to a discrete DAA for a multitude of voice, audio, DTMF, fax and data applications. The XE0092 replaces 25 to 30 discrete components with a single, fully-assembled and fully-tested unit. The XE0092 does not sacrifice performance for small size and surface-mount convenience. The wide bandwidth, low distortion design provides sufficient bandwidth for a 56K bps analog modem. Like all Cermetek DAA's the XE0092 is a complete DAA. It includes a 2-4 wire converter, loop current holding circuit, hook switch and ring indicator. It also supports Caller ID pass through. The XE0092 complies with FCC Part 68 rules for direct connection to the telephone line. Cermetek offers the XE0092 in three lead styles; the XE0092 with gull-wing leads the, leadless XE0092LCC, and the XE0092T through-hole model. All versions offer the same outstanding performance. +3.3 or 5 Volt power source for the XE0092. TX- together with TX+ forms the differential transmit signal input to the XE0092. If the host system uses a single ended transmit data output, connect that output to TX- and ground TX+. TX+ together with TX- forms the differential transmit signal input to the XE0092. If the host system uses a single ended transmit data output, connect that output to TX- and fround TX+. The /OH input controls the Switch-Hook in the XE0092. /OH is an active LOW input. Driving /OH LOW closes the switch-hook creating an electrical connection between the XE0092 and the local telephone line. The XE0092 drops the telephone line connection when /OH returns HIGH. The host can pulse /OH to simulate rotary dialing. The pulse rate in the US is ten pulses per second. A delay between digits of at least one hundred milliseconds is required. 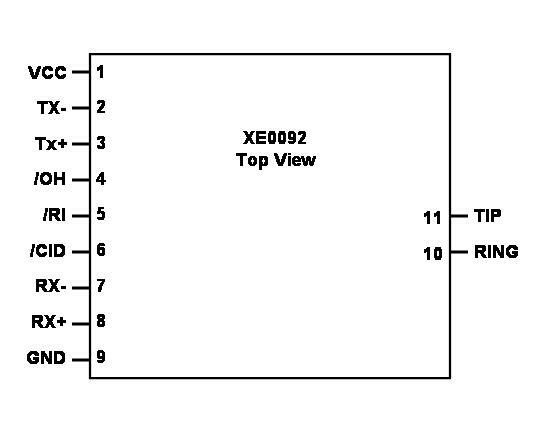 The XE0092 Ring indicate output, /RI, is active LOW. RI goes LOW for the duration of each incoming ring, and returning high between rings. /CID is an active LOW input to the XE0092. Driving /CID LOW after the first ring opens the signal path for the analog Caller ID signal to be presented on the RX- and RX+outputs. RX- together with RX+ forms the differential received signal output from the XE0092. If the host system uses a single ended received signal input, connect that input to RX+ and leave RX- output open. RX+ together with RX- forms the differential received signal output to the host system. If the host system uses a single ended received signal input, connect that input to RX+ and leave RX- output open. Ground connection to the XE0092. This signal provides the reference for the /OH input and /RI output. This pin should be connected to the systems digital ground. Tip together with Ring forms the two-wire local telephone line connection (RJ11 Pin 4). The telephone company places a DC "Battery" voltage across Tip and Ring on all public switched telephone lines. The XE0092 accept this line battery voltage without regard to its polarity. The public switched telephone network permits tone and rotary (pulse) dialing. Either can be used with the XE0092. Tone dialing requires an external signal source to generate the dialing tones. The dialing tones can be passed through the XE0092 after it is taken off-hook, /OH LOW. Create dialing tones with the XE0092 by toggling the /OH line. The XE0092 generates dialing pulses through momentary closures of the switch-hook using /OH. A series of switch-hook closures form each digit, one pulse for a one to ten pulses to dial a zero. The required pulse rate in North America is ten pulses per second. The dialing pulses are asymmetrical. The correct duty cycle of the pulses is 31 milliseconds ON and 69 milliseconds OFF. An inter-digit delay of at least one hundred milliseconds separates the digits. To permit tone dialing the XE0092 goes Off-Hook, /OH LOW. To dial each digit a unique DTMF, Dual Tone Multiple Frequency, tone pair is applied to TX+ and TX-. The higher frequency tone is always larger than the lower frequency tone. Transmit the tones for a minimum of 70 milliseconds, and leave a minimum of 70 milliseconds between digits. The following chart shows the correct DTMF signal frequencies for each digit. FCC Part 68 Rules set the allowable amplitude in the US for all signals placed on the telephone line other than live voice. Other countries have similar regulations. Signal levels are measured in dBm. Zero dBm is 1 milliwatt through a 600 ohm load. The 0dB insertion loss of the XE0092 mains that the signal placed on the telephone line will be the same amplitude as the signal presented on TX+ and TX-. Distortion is the most common measure of the quality of the signal path provided by the DAA. The primary source of this distortion is the line current holding circuit, although board layout and other factors can introduce distortion. Distortion varies with frequency. The voice band of the telephone line is limited to less than 4000 Hz. High speed modems such as 33.6K bps and 56K bps require virtually all of this bandwidth for signal transmission. Even if the distortion through a device is good in the center portion of the spectrum, signal quality is compromised if distortion greatly increases at the outer limits of the voice band. The XE0092 provides a low distortion signal path across the entire voice band. The telephone network typically sends the Caller ID signal between the first and second ring signals. To capture the Caller ID signal with the XE0092 the /CID input must be activvated, /CID LOW, before the end of the first ring. The Caller ID signal is then passed through the XE0092 to the host through the RX+ and RX- pins. 470 pFd, minimum 1500 Volts; these capacitors work in conjunction with Ferrites FB1 and FB2 to prevent unintended radiation when the telephone cable is attached to your system. These capacitors must be rated at a minimum of 1500 volts to maintain the isolation required by FCC Part 68 Rules. MOV1 protects against damage from indirect lightening strikes on the telephone lines. Cermetek recommends the Teccor P3100SDLR Sidactor to provide this protection. F1 and F2 prevent damage to the system when a power line crosses with the telephone line. Cermetek recommends the Raychem TR600-150 for this function. The TR600-150 is a PTC device which automatically resets after use. Note: To prevent possible violation of the 1500 Volt isolation barrier no components or traces should be placed under the XE0092LCC module. The XE0092 is subject to damage if over-exposed to heat during solder reflow operations. Following the soldering instructions below will ensure that the process of soldering the module to the board does not damage the modem. * The XE0092 can be ordered with an Operating Temperature of -40° C to +85° C at extra cost. Products tested to the higher temperature standard will be marked as –ITR. Note: All interface pins are 0.25 inches square, Gold plated. When developing a product to be connected to the telephone line, it is necessary to use a circuit known as a Data Access Arrangement (DAA) which complies with regulations of the appropriate governmental agency. In the US this agency is the Federal Communications Commission (FCC), while in Canada it is Industry Canada (IC). These agencies define tests of the product to ensure that it meets the requirements. These requirements protect the telephone system from damage and protecting the user from high voltage transients (such as lightning strikes) which may come down the telephone line. For the normal “permissive” (standard) telephone line, equipment which transmits data (such as a modem) must not exceed a transmission level of -9 dBm. If the system is capable of DTMF dialing, the maximum DTMF transmission level must be less than 0 dBm averaged over a 3 second interval. A delay of 2 seconds or greater is required after the time the XE0092 is taken “off hook” and before any information is transmitted. This is required to ensure that billing information may be exchanged between telephone company central offices without interference. The user of the XE0092 must certify to the FCC that the final system meets the requirements of Part 68 which include the criteria above as well as the high voltage protection provided by the XE0092. This is generally accomplished through an independent testing lab which tests the System and submits the proper paperwork to the FCC for approval. Since the XE0092 already complies with FCC Part 68 rules, this is a relatively simple process. Cermetek offers a several variations of the XE0092. Variants include surface-mount pins, through-hole pins and no pins. All pin variations are available in the standard 0° to 70° C operating range or in an extended operating temperature range of -40° to +85° C. The table below lists the available XE0092 models. Devices sold by Cermetek are covered by the warranty provisions appearing in its Terms of Sale only. Cermetek makes no warranty, express, statutory, implied, or by description regarding the information set forth herein, or regarding the freedom of the described devices from patent infringement. Cermetek makes no warranty of merchantability or fitness for any purposes. Cermetek reserves the right to discontinue production and change specifications and prices at any time and without notice. This product is intended for use in normal commercial applications. Applications requiring extended temperature range, unusual environmental requirements, or high reliability applications, such as military, medical life-support or life-sustaining equipment, are specifically not recommended without additional processing and authorization by Cermetek for such application. Cermetek products are not authorized for use as Critical Components in Life Support Devices or Systems. Life Support Devices or Systems are devices or systems which, (a) are intended for surgical implant into the body, or (b) support or sustain life, and whose failure to perform, when properly used in accordance with instructions provided in the labeling, can be reasonably expected to result in significant injury to the user. A Critical Component is any component of a life support device or system whose failure to perform can be reasonably expected to cause failure of the life support device or system, or to affect its safety or effectiveness. Copyright 2009 Cermetek Microelectronics, Inc.